It’s no secret that Lingraphica loves augmentative and alternative communication (AAC) devices; however, we know many clinicians may find it daunting to introduce a high-tech solution into their client’s lifestyle. We’re here to squash those spooky fears. Concern: If I introduce a high-tech device into my client’s life, it could cause stress, anxiety, or fear. Answer: Don’t be afraid! Our devices are designed to wipe out the stress, anxiety and fear associated with language loss. Created with icons, images, and content geared toward functional communication needs, Lingraphica’s devices have all of the tools your clients need to communicate. Plus, we offer free support and training for the lifetime of the device so your clients always have access to additional lessons. Concern: I am not very tech savvy and AAC is not my clinical strength, but I want to provide the best care for my client. Answer: We’ve got you covered! When you initiate a Lingraphica trial, you will be assigned your own, personal Clinical Consultant, who will support you every step of the way. Your Clinical Consultant is a licensed and ASHA-certified speech-language pathologist (SLP) with experience completing AAC trials and establishing medical necessity. Your Consultant will be available to show you how to use and customize the Lingraphica SGD during the trial. She will also answer your questions, troubleshoot, and problem solve with you. When it comes to trialing a Lingraphica SGD there is nothing to fear. Concern: Once the client leaves my caseload I won’t be able to help them with the device. Answer: Lingraphica’s support doesn’t end when the trial is completed. In fact, our Clinical Consultant and Technical Support teams are available to support your client’s needs for the lifetime of the device. We also offer free trainings for caregivers and loved ones, so your client’s family members can also understand the device. With this level of support, you can rest assured your client will continue to use their Lingraphica long after the trial is completed. Concern: I’m swamped! I don’t have time to write all of the extra paperwork involved in recommending durable medical equipment for my client. Answer: We hear you! Our Clinical Consultants are licensed and ASHA-certified SLPs who have been in your shoes. We have streamlined the paperwork process and will work with you along the way to ensure that your documentation meets the requirements for demonstrating medical necessity, without the extra paperwork. Concern: I want to ensure that my treatment recommendations follow evidence-based practice. I’m not sure that a high-tech AAC device is clinically relevant. 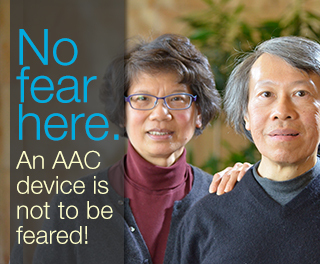 Answer: Lingraphica’s devices are backed by 30 years of AAC and aphasia research. Our Chief Scientist, Dr. Richard Steele, has published numerous studies about the device’s features including projection of the icons, the content, and the usefulness of an SGD in daily life. You can read them here. Concern: There are other communication options I can recommend for my client. I’m not sure an SGD is the right one. Answer: It’s true that there are many different low-and-high-tech AAC options including iPad apps, pen and paper, and whiteboards, which might work for your client. However; given the option of navigating a variety of apps, writing out every message, and pointing to pictures in a communication notebook, most people would prefer a single, efficient, easy-to-use, language system. Lingraphica ’s SGDs can bridge this gap. Plus, our unique customization and personalization features mean that no one device is the same. Our SGDs are available in a laptop or tablet size, so you can recommend the one that best fits the lifestyle and communication needs of your client. Concern: An SGD is a big investment for my client. I don’t feel comfortable recommending a solution so expensive. Answer: We understand that your clients are facing multiple medical bills and some hardship. The good news is we have an entire team devoted to reimbursement and financing options. This team works with your client’s insurance to obtain funding. Plus, Medicare and many insurance companies cover the cost of an SGD. We hope this blog was a treat, but if you still have concerns or questions about an SGD, please call our team at 888-274-2742. We can help!